For the past few weeks I’ve been having all kinds of problems with my TiVo Series 3. The problem is only happening on the HD channels. At least once a day, I’m getting a heavily pixelated picture, video stopping and starting every couple of seconds and audio cutting out. Sometimes the picture will be lost completely and I’ll get a gray screen, even though the signal appears to be good according to the TiVo diagnostics. Here’s a video of what all of this looked like earlier today, including a look at the Diagnositcs screen. I will try to update this post periodically as I work my way through this issue. Feel free to leave a comment if you’re experiencing similar issues or if you have any suggestions. I’ve been a huge fan of TiVo over the years and, I have to say, this is the most frustrated that I’ve ever been with their equipment. I spoke with Comcast customer service the other night and they sent a few signals to the cable cards that were supposed to help with reception issues. The problem didn’t go away. I wanted to rule out the cable cards as the source of the problem, so we went to the local Comcast office and swapped out the cable cards (at no charge). 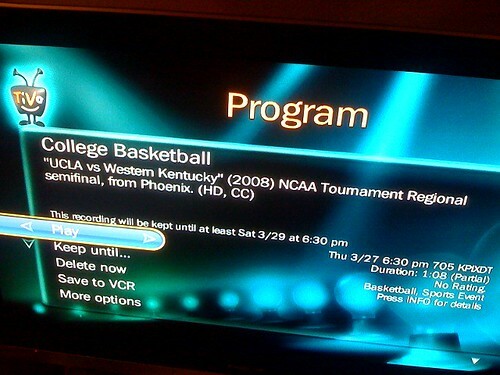 I popped the new cards into the TiVo but the problem didn’t go away. 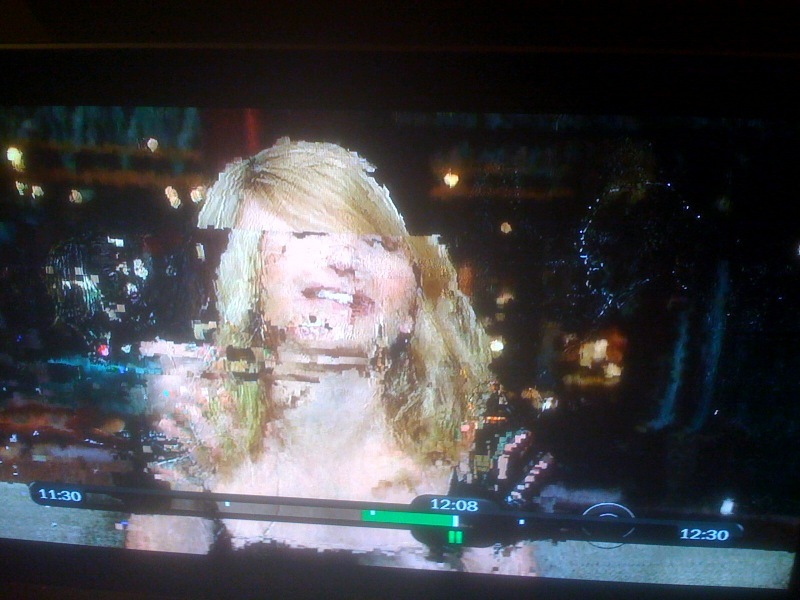 Every HD show that I tried to record tonight was heavily pixelated with audio cutting out. I called TiVo customer service and explained the problems that I’m having. The CSR that I spoke with had me check the signal strength on the two cable cards. When I told him that the signal strength was 95-100 he told me that installing an attenuator on the line would probably solve the problem. It’s counter intuitive but apparently the Comcast signal is too strong for the TiVo Series 3 and is overwhelming the TiVo tuner. According to him, the optimal signal strength for the TiVo Series 3 is 83-88. I came across this very helpful thread on DSL Reports, which confirms that the pixelation problems that I’m experiencing are due to a “hot” signal. One of the posts included a link to a popular attenuator carried by SmartHome. I ordered it ($12.99 + $12.75) and should be receiving the attenuator this weekend. Hopefully the attenuator will do the trick. I received the attenuator in the mail and installed it on my cable line (following these instructions). At first it looked like the problem was solved but a few hours later the pixelation returned with a vengeance (see below for a photo). I’m rapidly losing all of the brand love that I had for TiVo. I’m not really sure what I’ll do next. I’ll probably go back to the Comcast DVR (made by Mororola) or maybe even go back to DIRECTV. It doesn’t happen very often, but every now and then I see an error message on TiVo that I’ve never seen before. And with my luck, it usually happens on an important recording. 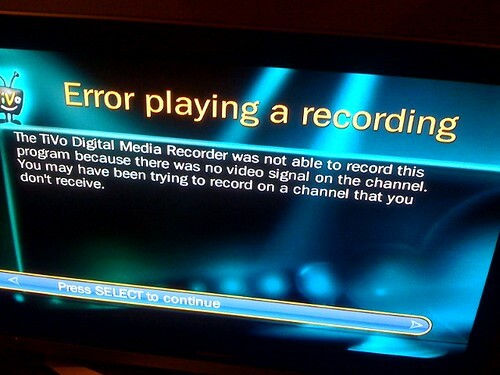 But when I tried to play the recording I got this error message, which I have NEVER seen before. This was a total and complete FAIL by TiVo.